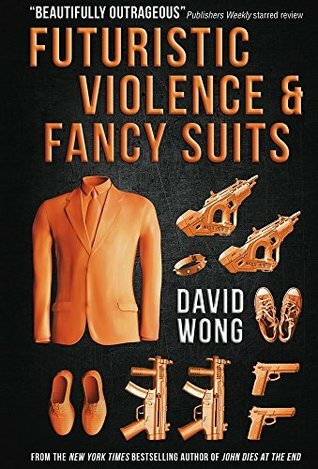 Image Description: book-cover of Futuristic Violence and Fancy Suits by David Wong. The background of the cover is black, with a collection of assorted items on the cover displayed as orange (with the exception of the Author Name which is in white text). From left to right, the top half of a suit you may find on a mannequin (suit coat, shirt, and tie), dress shoes. two machine guns, two hand-held guns, a pair of sneakers, a spiky cat collar, and two ray-guns. Nightmarish villains with superhuman enhancements. An all-seeing social network that tracks your every move. Mysterious, smooth-talking power players who lurk behind the scenes. A young woman from the trailer park. And her very smelly cat. Together, they will decide the future of mankind. 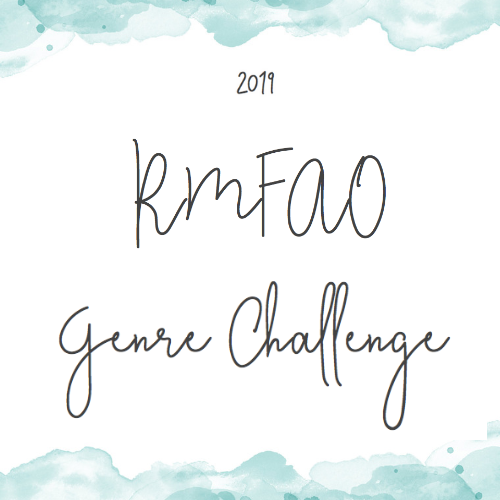 Get ready for a world in which anyone can have the powers of a god or the fame of a pop star, in which human achievement soars to new heights while its depravity plunges to the blackest depths. A world in which at least one cat smells like a seafood shop’s dumpster on a hot summer day. This is the world in which Zoey Ashe finds herself, navigating a futuristic city in which one can find elements of the fantastic, nightmarish and ridiculous on any street corner. Her only trusted advisor is the aforementioned cat, but even in the future, cats cannot give advice. At least not any that you’d want to follow. Will Zoey figure it all out in time? Or maybe the better question is, will you? After all, the future is coming sooner than you think. ~Engaging Plot: The novel is very action orientated, the stakes are continuously raised, the pacing is fast and engaging, and I had to know what happened next. This novel does focus more on plot than on character, however, I started reading this book as a form of escapism and this mission was accomplished. The kind of scary thing about this novel is that elements of the plot (society’s obsession with social media and personal branding) have started popping up in Real Life as well. ~Social Commentary: As this novel focuses on how Zoey (the fish-out-of-water main character who has grown in a trailer park her whole life) struggle to deal with being thrust into a strange world of The Wealthy Elite, there’s a lot of Classism commentary going on in this novel, which was fine with me. In fact, given the current political climate, it’s very appropriate. The reality of the plot is that if Will had taken Zoey seriously as a person from the beginning, considered Zoey a three-dimensional person with her own wants and needs, fears and desires, a lot of the plot wouldn’t have occurred. In the beginning, Will and Molech come across as very similar, and their shared inability to see people of different classes as people just like them is the source for a lot of the book’s conflicts. I would like to point out that Will and the rest of The Suits are never presented as “the good guys”, this book is very much a case of Grey Morality versus Black Morality, and this does work, however, I’d also like to point out that Will and the Suits do improve by the end of the novel. 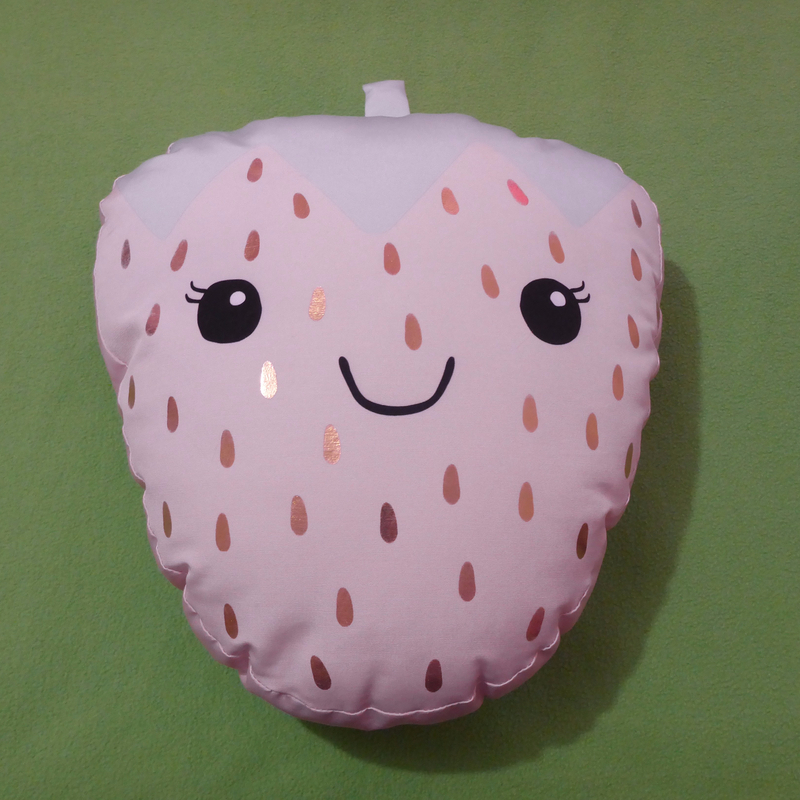 ~Character Development: I understand that some readers had a problem with Zoey, due to and that she “wasn’t like other girls”, however, I didn’t get that vibe from her and I enjoyed reading her point of view. Zoey does kind of act as morality pet for her father Arthur and, by extension, Will and The Suits. While Will is an interesting character in own right, I’m a little disappointed that the book focuses more on Will, and less focus on Echo (she’s fascinating). Plot-wise this does make sense. Will was Arthur’s right-hand man, he’s the one that knows what goes on “front of house” and “back of house”, and it was only natural that, in his grief, Will would feel some form of jealousy towards Zoey. All in all, a fun adventure set in a dystopian future, and I hope David Wong eventually writes a sequel.